This pinata is made of cardboard and tissue paper and measures 21.75 inches. Put little superheroes on the case to track down some party treats with this cool Batman Pull String Pinata. To get the fun started, just hang it up and have guests takes turns pulling on the 12 hanging strings until they find the one that releases the super-powered sweets inside -- no hitting or whacking required! Then, watch little crime-fighters scramble to collect all the candy they can carry to bring back to their bat cave at the end of the day. 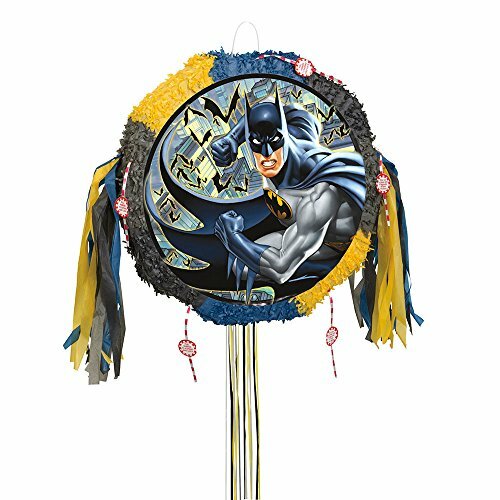 With enough room inside to hold 2 pounds of candy, small superhero toys, and other Gotham-inspired goodies, this pull-string pinata is sure to be a knockout addition to any Batman birthday party or superhero party. Best of all, since this pull pinata won't get broken open during the bash, the birthday boy will be able to save it as a super cool Batman decoration to display in his room afterwards. Holy smokes, Batman! Your body is full of candy! Your caped crusaders are going to love attempting to open up this Dark Knight pinata. 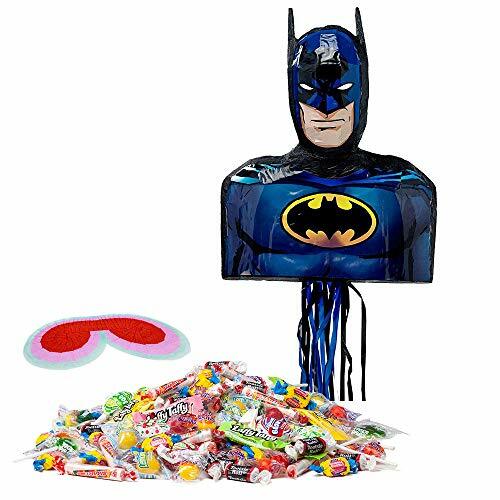 The Batman Shape Pinata Kit comes with one Batman shaped pinata, a three pound bag of candy, and one blindfold mask. A fantastic addition to your youngster's superhero themed birthday celebration, this traditional game allows everyone a chance to become a hero for a day! Blindfold each child before they attempt to pull the right strings, and the guest who makes the right move will be rewarded with an avalanche of candy treats. Everyone else will be ready to collect the delicious loot. Batman 3D Pinata Kit includes: (1) Batman 3D Pull-String Pinata, Candy and Toy Pinata Fillers, (1) Pinata Blindfold, and (1) Pinata Buster. Batman Airwalker, 36" x 44", Giant shaped foil balloon in action stance. Great play factor. Perfect for parties! 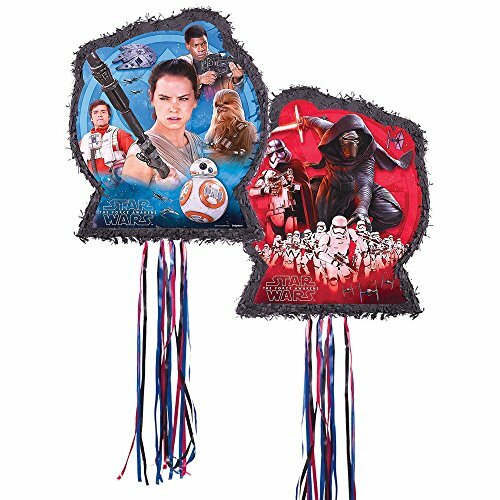 The First Order and the Resistance are on opposing sides in The Force Awakens, and they're literally on opposite sides of the Star Wars Episodes VII Pinata. This all black shaped party piece has a blue decal with the heroes of the galaxy on one side, including Chewie, BB-8, Rey, Finn, and Poe. The flip side is deep red with Kylo Ren, Captain Phasma, and a fleet of Stormtroopers. Animal Adventure introduces popular DC characters as soft toys for playtime and cuddle time. Wonder Woman, Superman, Batman and the Joker are made using ultra-soft fabrics. 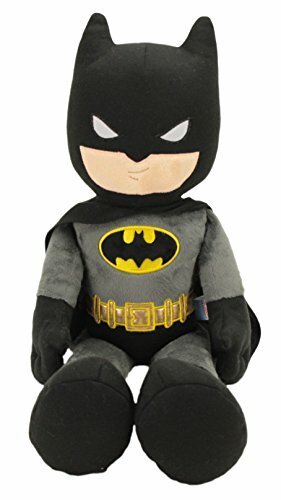 Each soft toy is based on the comic book characters and all are sure to become lifelong friends for children of all ages. Kids will love playing with our fun Batman Punch Ball Balloons. These two 16-inch latex punch balloons are decked out with the Bat-Signal, making them ideal for any kids Batman birthday party. Each of these two punching balls feature a rubber band for guests to hold onto as they punch away. See who can keep their punching balloon bouncing the longest! The action doesn't have to stop at the birthday party — throw a punching ball into each goodie bag for kids to take home. Bring the Dark Knight to your party with more of our Batman themed party supplies. Who knew that Batman could be so easily defeated by a simple string! 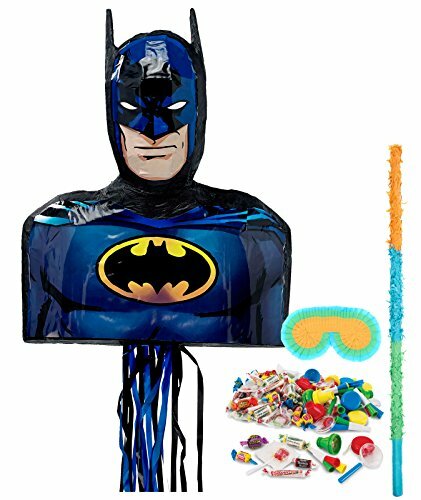 The Batman Shape Pinata Kit comes with a pinata that can be opened by pulling the magical string on the bottom as well as a bag of candy and a blindfold mask. With this kit you will receive: (1) 23" Lego Batman SuperShape Foil Balloon, (1) 34" Black Number 4 Foil Balloon, (2) 18" Square Lego Batman Foil Balloons, (1) 27" Batman Emblem Foil Balloon, (1) 18" Black Balloon Jubilee Foil and (5) 11" Latex Balloons 1- Red, 1- Yellow, 1- Lime, 1- Black. Just add Helium and ENJOY! Every boy wants to celebrate with a Batman birthday party. Take your child's Batman birthday party or superhero party to new heights with this Foil Batman Balloon. 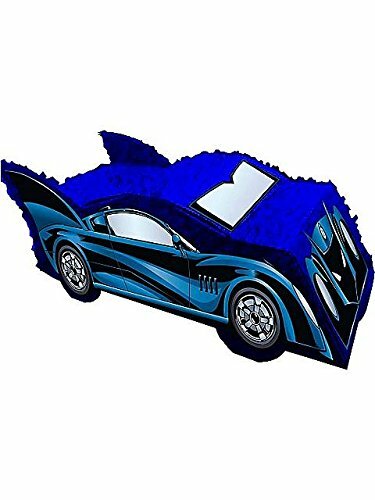 It features a colorful graphic of the Caped Crusader leaping into action in his beloved Gotham City. This party balloon is sure to make a statement. Tie it to the back of the birthday chair, a special present or outside on your mailbox. You could also combine this Batman party decoration balloon with an assortment of matching, solid color latex balloons. Create a unique balloon bouquet or table centerpiece. This Batman party supplies balloon measures 18" when fully inflated for full-size fun, and it ships uninflated. Coordinate it to mix and match with other Batman or superhero party decorations and party supplies that are each sold separately. The package comes with one foil balloon. Bring your little one's favorite superhero home to party. This Foil Batman Balloon will thrill your superhero-loving child and friends. Bring some Gotham City flair to your party space with these Latex Batman Balloons. 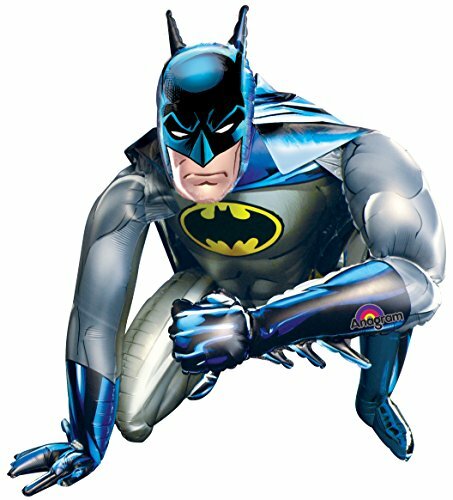 Fantastic for any boy's superhero birthday party or Batman-themed party, these helium-quality balloons come in four cool colors (light blue, red, yellow and silver) and are each printed on one side with a black silhouette of the Caped Crusader flying into action. Tie them individually throughout your party venue, including the back of the birthday boy's chair, to create an action-packed party atmosphere. Latex balloons are also great for mixing with foil balloons into a festive balloon centerpiece or bouquet. 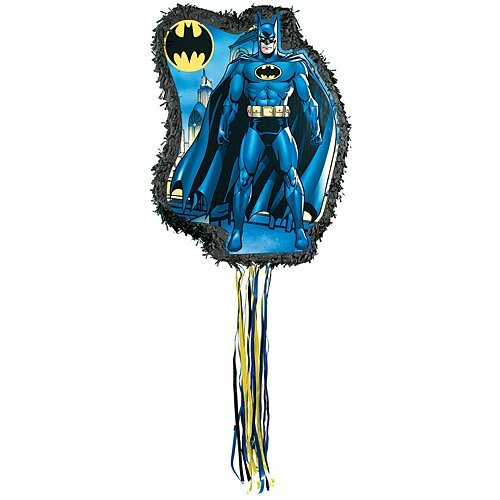 batman pinata i sell wholesale pinatas and candies and other party supplies.